Trained as an architect, Dehlinger (b. 1939) works in algorithmic art, architecture and design as well as a planning consultant and lecturer. 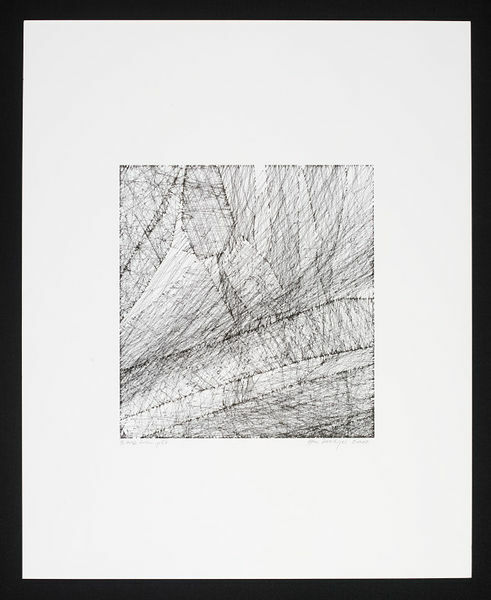 His artistic interest lies in exploring the pictorial possibilities of the plotted line. And here especially the mechanically directed pen or drawing device, the simple, monochrome line and the design of the generative code. For him the challenges of machine supported drawings can be found in generating the programs and strategies to consequently develop algorithmic drawings, which are able to clearly demonstrate that they originated within the universe of the machine. A pen plotter is a mechanical drawing device that holds a pen or brush and is linked to a computer that controls its movements. Plotter drawings can be very time consuming to produce. 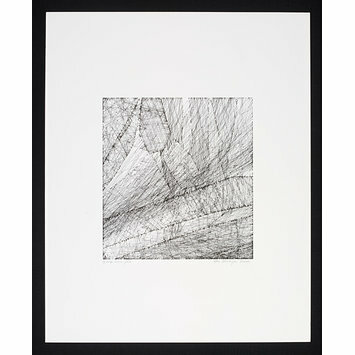 Black and white plotter drawing 'exploring the plotted line as a means of expression' (cit. artist). Titled, signed and dated with pencil at bottom. Inscribed at the back of plotter drawing. Plotter drawing on paper, 'Trim.plt', by Hans Dehlinger, 2002.